The 2010 Stanley Cup Final marks the Philadelphia Flyers’ eighth appearance in the NHL’s championship round. To this point, the Flyers are 2-5 in the Finals. Interestingly, the club has often fared better in the pre-series underdog role than as the favorites. Here’s a look back at the pre-Finals scuttlebutt for the Flyers’ previous appearances in the Finals. It should be noted also that, in the Flyers’ runs to the Finals in 1974, 1975 and 1976 there were only three rounds of playoffs, rather than four. 1974: The Flyers were huge underdogs entering the Finals against the fearsome Boston Bruins. But the Flyers went on to shock everyone but themselves by defeating Boston in six games to become the first NHL expansion team to win the Stanley Cup. The keys to victory were the club’s perfect record on home ice throughout the entire playoffs, the extraordinary goaltending of Conn Smythe Trophy winner Bernie Parent and the club’s dramatic last-minute comeback and overtime victory at the Boston Gardens in Game 2 of the Finals. The Flyers topped it off with a 1-0 shutout at the Spectrum in the deciding game. 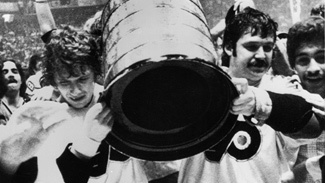 Bobby Clarke (left) and Bernie Parent of the Philadelphia Flyers carry the Stanley Cup as they celebrate their series-winning victory over the Boston Bruins on May 19, 1974. 1975: Although the Flyers were the defending champions and had the home ice advantage, many considered the speedier Buffalo Sabres (with the nearly unstoppable French Connection line of Gilbert Perrault, Richard Martin and Rene Robert leading the attack) to be the more talented squad. The Flyers were once again flawless on home ice in the final round, winning all three games at the Spectrum. Repeat Conn Smythe Trophy winner Parent shut out the Sabres, 2-0, in the Cup-clinching sixth game at The Aud in Buffalo. Many players subsequently said that Parent was even better against Buffalo than he had been against Boston. 1976: Now two-time defending champions and the only NHL team to defeat CSKA Moscow (Red Army) during the legendary Russian team’s North American tour during the 1975-76 season, the Broad Street Bullies still got little respect from the Canadian or New York-dominated hockey media. At most, they entered the 1976 Finals considered an even match for an extraordinarily deep and talented Montreal Canadiens team. Montreal went on to sweep the series – something the Flyers’ critics still crow about to this day. It should be noted, however, that Parent was injured and unable to play in the finals. The Flyers were also set back by an injury to second-line sniper Rick MacLeish, rendering the vaunted LCB line (Conn Smythe Trophy winner Reggie Leach, Hart Trophy winner Bobby Clarke and future Hockey Hall of Fame inductee Bill Barber) the club’s only dangerous line in the last series. Three of the four games were decided by one goal. The deciding game was tied, 3-3, heading into the third period but two latter-period goals by Montreal won the game and series for the Habs. 1980: On the heels of an incredible regular season that saw the club post a record 35-game unbeaten streak, the Flyers were favored to beat their Patrick Division rival New York Islanders. In a war of a series, the Islanders prevailed in six games. Although the series’ most infamous moment was a blown first-period offside call by linesman Leon Stickle that led to a goal and contributed to the Islanders’ Cup-clinching overtime victory, the Islanders’ red-hot power play was the biggest single factor in the series outcome. New York, like the Habs, went on to win four straight Stanley Cups. 1985: The Flyers always seemed to fare well against the Edmonton Oilers dynasty during the regular season, but fell short when they met again in the Stanley Cup Final. The youngest team in the NHL, the Flyers shocked the league by posting the league’s best record during the regular season and advancing to the Finals behind Vezina Trophy-winning goaltender Pelle Lindbergh and the fiery coaching of rookie NHL bench boss, Mike Keenan. The Flyers were nevertheless the underdogs heading into the Final against an Edmonton team widely considered the best in NHL history. Lindbergh and company stymied the Oilers in Game 1 at the Spectrum, but eventually a knee injury to Lindbergh (suffered originally in the Semifinals and aggravated in Game 4 of the Final) forced him out of the series. The club was also set back by key injuries to Tim Kerr, Brad McCrimmon and the lingering effects of broken ribs suffered by captain Dave Poulin earlier in the playoffs. The Flyers lost a winnable second game of the series, and Edmonton went on to win the next three, including a blowout win in Game 5. 1987: The Flyers were once again banged up heading into the Final with Edmonton, and were once again prohibitive underdogs. But a fiery rookie goaltender named Ron Hextall and a never-say-die team in front of him gave the Oilers all they could handle. The Flyers battled back from a 3-to-1 series deficit when virtually everyone else had conceded the Stanley Cup to the Oilers, forcing a seventh game in Edmonton. In the deciding game, the Flyers took an early lead but soon ran out of steam, and the Oilers went on to win the game, 3-1. In a losing cause, Hextall was named Conn Smythe Trophy winner. 1997: The Flyers entered the 1997 Stanley Cup Final as the favorites to beat a Detroit Red Wings club that had developed the reputation for excelling in the regular season but folding under playoff pressure. Instead, the series turned into a debacle for the Flyers. The Red Wings proved to be a far superior club, taking advantage of shaky goaltending by Hextall and Garth Snow and a depleted blue line. The Wings also shut down the Legion of Doom line (Eric Lindros, John LeClair and an injured Mikael Renberg, who was replaced by rookie Dainius Zubrus in Games 2, 3 and 4). An ill-stated remark by head coach Terry Murray, who said his team was in “a choking situation”, further cemented the collapse and led to his dismissal as coach after the series.